and finally: The Medallists sheet. 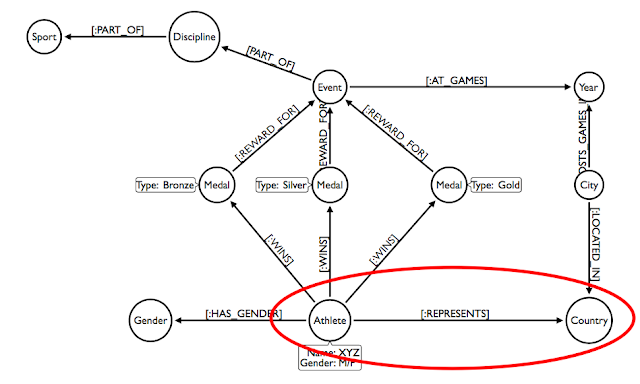 Now, in order to load that data into Neo4j, I had to come up with a meaningful graph model. In order to load the data like that, I would obviously have to prepare a few things, more specifically make sure that the schema (indexes, constraints) of our Neo4j graph would be nicely prepared. Which would allow me to load the data into Neo4j efficiently. Then we can start loading the actual data from the different CSV files. All of that went pretty smoothly. But then of course, I hit a problem. Specifically, when I tried to connect the Athletes to the Countries they represent, I found that the loading process would take forever. The loading process did eventually finish, but only after like 800+ seconds on my tiny little laptop. What. Was. Going. On??? After a bit of troubleshooting, I found out that I had in fact stumbled on a little bug in Neo4j. In order to explain what happened, I'd like to step back a little bit, and explain a couple of fundamental things about Neo4j's Cypher query language and the fundamentals underneath it. For those of you familiar with CYPHER and declarative database query languages in general, you know that there are several steps for a query to get executed in a database like Neo4j. One of the most crucial steps in that process is the query planning - where the database tries to make sense of the question that you are trying to ask, and comes up with a strategy to retrieve that data that you declared that you want, from disk/memory. It’s a crucial step, because choosing the right or wrong strategy can mean a whole lot to a database query: think of it like a route planning decision making process - if you at one point in your route planning take a wrong turn, it can make the difference between fast/slow routing, for sure. Rule: This planner has rules that are used to produce execution plans. The planner considers available indexes, but does not use statistical information to guide the query compilation. Cost: This planner uses the statistics service in Neo4j to assign cost to alternative plans and picks the cheapest one. While this should lead to superior execution plans in most cases, it is still under development. The Neo4j Cypher team has been hard at work for the past couple of versions of the database to introduce this cost-based querying methodology - and has been very successful at it. But: it was a staged introduction (starting with READ operations, and only recently introducing COST-based write operations), and… it contained some issues here and there. And one of these issues was hit during my Olympic data loading. The problem I was seeing with my LOAD CSV operation on the country representations, was caused by the new Cost-based query planner for WRITE operations, which was producing a cr@ppy plan for the loading. 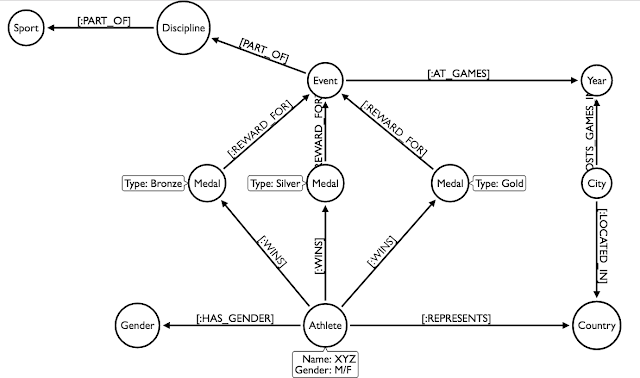 Let's illustrate that by using Neo4j's nice and convenient way to switch query planners. All I need to do is prefix my cypher statement with a specifc instruction, and it will switch back from the default COST-based system to the (in this case, temporarily) more appropriate RULE-based system. The plan looks very different, much simpler, and therefore also much faster. Looking good! The entire dataset has been loaded and is now ready for querying. That’s of course what we will do in part 3 of this blogpost series. PS: you can find the entire load script in this gist on github.